[Update Aug 5, 2016] We received a response from the City of Irvine. Mayor Steven S. Choi immediately communicated his concerns to the Mayor of Seocho-gu and requested that she do everything in her power to address the animal cruelty. Click HERE to read more and send thank you email to Mayor and the City Council of Irvine. Seoul Seocho District became Sister city with Irvine in 2013. Culture, art, high-end shops, first-class hotels and fashionable streets – all can be found within Seocho District in the ‘City of Corporation and IT Industry’; regrettably, so can the so-called ‘health-food centers’, places that brutally slaughter dogs and cats, to be served up as food and drinks. A Search Engine reveals the sickening scale of Seoul Seocho District’s dog meat demand. 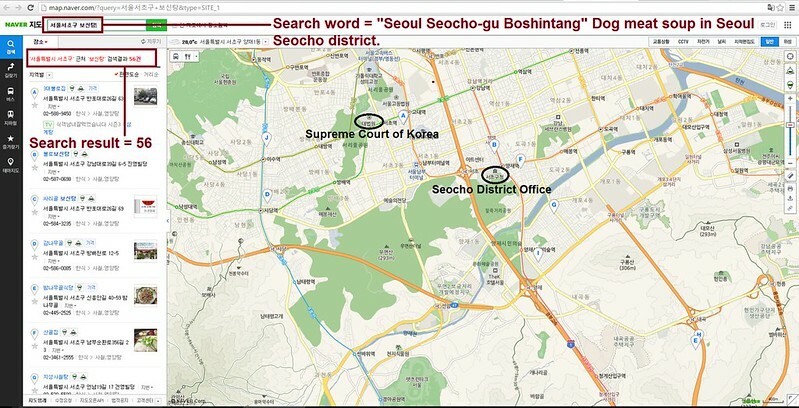 The searches resulted in: 130 Health Food Centers; and 56 restaurants in and around the city of Seoul Seocho District alone. Even if half of these ‘Health’ Food Centers and restaurants serve dog and cat ‘ingredients’ in one form or another, just imagine how many dog/cat slaughterhouses must be present in and around Seoul Seocho District in order to supply all of these outlets. Please sign petition, call and email Irvine Mayor Steven S. Choi, TODAY! Seoul Seocho District is one of the largest dog meat consumption areas in South Korea. The Korean internet searches resulted in: 130 Health Food Centers which commonly sell dog/cat elixirs (also known as dog soju and cat soju); and 56 dog meat soup restaurants in and around the city of Seoul Seocho District alone. No matter where you live PLEASE SHARE these actions with your friends – especially those who live in Irvine! Poor animals suffer and no one stops it. Stop being cruel to animals!!!!!!!!! choices? This tragedy could end, if leaders would help the animal protection groups enable the dog-meat farmers to transition to another line of work…. Please stop this cruelty, it is animal cruelty and you should be opposed to it. This horrible and unimaginable practice needs to be stopped now. No animal deserves to be treated in such an inhumane and barbaric manner! This is beyond sickening. These innocent animals never done anything to you people this needs to be stopped immediately there’s no reason for this act of abuse and tourter there are other ways to survive and celebrate you don’t have to kill these innocent animals that belong to someone else. Please dont let this go on. Its so hurtful to see these loving animals being tortured. This kills me knowing. Please please help stop this!! !